Bribie Island has a vast array of activities both land and sea! From golf to shopping, boating to beauty, or relaxing with a walk along the water front pathways or ocean beach. You decide! and is open 7 days on school holidays* (closed Wednesdays out of holidays) 6.30am - 5pm. Bribie Island Boat Hire provides boat hire for 1/2 or full day, with 4 or 5 person boats, starting from $60 for a half day and $80 for a full day. Kayak hire of single or double kayaks, starts from $20 for 2hrs. Boab Boat Hire provides you with an easy, affordable and safe option when it’s time for you to get out on the water. Our selection of well maintained, environmentally friendly hire boats come equipped for you on a trailer or already launched and ready to go. Whether it’s a lazy day spent cruising, a fun filled day of water sports, or an inshore or offshore fishing adventure we have the boat for you! We have 6m Centre Cabs and 5m Side Console boats for hire. All you need is a current boat licence and the boat is yours. 24@Bribie is a dynamic fun hire & adventure tour company with reputation for providing a reliable, affordable & fun service for Bribie Island adventure goers of all ages, placing an emphasis on providing fantastic customer service and quality hire products & tours, including tandem bikes, kayak and adventure tours. OUR MISSION: "To provide excellent quality service and be of value to all of our Customers"
We are OPEN at various locations on Bribie Island during the weekends, please call for mid-week availability. Bribie Island Golf Club, 'the hidden treasure' of south-east Queensland golf courses. Built on the rolling natural sand dunes of Bribie Island, the 18 hole championship layout offers golfers an enjoyable test of skill. With its seaside location and bush land setting the course offers all the playing advantages of a sand-belt course but with the added bonus of wonderful subtropical weather! Suitable and enjoyable for the beginner to the professional golfer. pre-wedding jitters & relax on our world class championship course with a round of 9 holes from just $45.00 p/p or 18 holes for $69.00 including shared carts, or inquire about group rates. Enjoy a game of Barefoot bowls @ the Bribie Island Sports Club! Get all your weddings guests together before the wedding day for a game of Barefoot Bowls, enjoy a drink from the bar with nibbles or a BBQ to follow, to catch up with all your family and friends, and its a great fun and relaxed way for your guests to mingle and meet one another! Nurture Skin and Beauty offers all aspects of professional beauty therapy and relaxation treatments, with microdermabrasion, facials, pedicures, spray tanning, massage (including hot rock) and beauty spa pamper packages. Nurture Skin & Beauty use organic skin & body care in all our beauty treatments, to help you relax and be your own kind of beautiful... naturally. Here’s a new way to explore beautiful Bribie Island waterways! 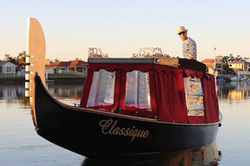 Experience a peaceful Gondola Cruise or Sunset experience. The Island Gondola seats up to 6, or is perfect for a romantic couple seeking special time alone. The “Classique” Gondola is a newly refurbished unique boat with a silent motor, lined with luxury comfort and steered by qualified coxswain for your cruise around the lovely Bribie Island waters.